Awesome weather! Finishing up many of the summer improvement and maintenance projects, I can’t remember a time with more contractors working at the clubhouse and common areas at the same time: general contractors, drywall installers, electricians, elevator service workers, road laborers, common area landscape installers, air conditioner servicemen, Fitness Room equipment installers, cable TV and internet service installers. It seems a chaotic race to the finish line to complete these projects. The most challenging and frustrating is the elevator replacement – four separate contractors working with various tasks of permits, coordination, scheduling and planning. We are still pushing and working as fast as possible to get this project completed as soon as possible. It has been very difficult with all of the variables and coordination. Whenever you would like it to rain, just schedule road work in SunBird. This is the third year in a row with hardly any rain all year until the road work is scheduled. The rain caused the first day of scheduled work to be delayed, but the second day, the contractor worked double time to get back on schedule. The road maintenance work has been completed for this year. Thirty-seven large cracks on Kerby Farms and Championship Drive were completely removed and replaced. Units 3A and 4 have had crack sealing and seal coating spread across the entire roadway. A routine maintenance schedule will assist in prolonging the life of the roads and save money in the long run. Fitness Room had some additional new up-to-date exercise equipment added, painted new colors, additional TVs added and a dedicated “Wi-Fi” system. The equipment was rearranged for ADA and safety compliance and for better use of the space. The Fitness Room has plenty of great equipment and looks great. This is one of SunBird’s most used recreational facilities. Clubhouse room addition and balcony extension is nearing completion. When completed, this will add a room to seat over 40 more card players and can be used for other functions. It will also have a beautiful large covered balcony with patio seating overlooking the spectacular views of SunBird. Common area landscape irrigation project of Phase 1 has been completed. Phase 2 of this project may begin earlier this next year to allow time for the start of Phase 3 for the beginning of refurbishing the landscaping in these areas. This project has been progressing very well and will help with conserving water, maintaining a better irrigation system, saving time and money and updating the look of the common areas. The operating budget and plans for 2019 are nearing final approval. The budget process began in April of this year and has been under study and review over the past three months. Some of the major capital improvement, replacement and maintenance plans that are being considered for completion in 2019 are 1) clubhouse flooring, 2) clubhouse exterior painting, 3) road maintenance and replacement of some areas, 4) common area landscape refurbish project Phase 2 and 5) replacement of sport courts 1 and 2 with post tension concrete and other miscellaneous projects. 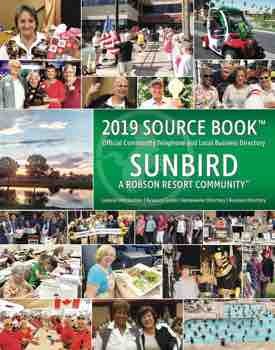 Keeping up-to-date facilities and amenities with proper funding and savings is key to SunBird’s current and future success. The month of November is widely known as a time of thanksgiving and gratitude. SunBird has many veterans living here and/or have family members who served or have passed on and/or family members currently serving. We will be honoring all service persons on November 11 in the ballroom at our Veterans Day program. Without the many sacrifices of our service people, we would not have the freedoms and luxuries of life we enjoy each day. Let’s show gratitude to our veterans and be thankful for what we have. Thank you for your service. Have a wonderful Veterans Day and a Happy Thanksgiving!